If you’re eating something you did not personally cook or that is not fresh, it mostly likely will have a preservative in it. 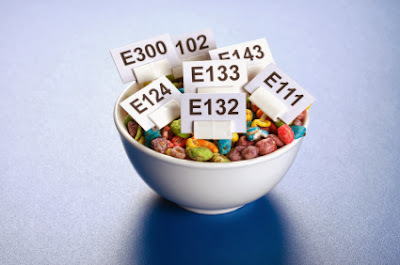 Most processed foods are made in a factory where preservatives need to be added to extend product shelf life. At first glance, the role of preservatives may look innocent. They are simply there to keep your food safe from spoiling, right? Unfortunately, many of the chemicals used to preserve foods longer may not necessarily help us live longer, healthier lives. You will generally run into three types of preservatives. One type prevents growth of mold or bacteria (anti-microbial). Another type of preservative is used to stop fruits and vegetables from ripening. Finally, a third kind of preservatives is used to prevent oxidation of foods (antioxidants), which can lead to rancidity or color changes. Some preservatives have proven to be safe, thankfully. For example, calcium propionate is a preservative used in breads and rolls to prevent mold growth. Acetic acid, a chemical naturally found in vinegar, also acts as a preservative. Butylated Hydroxyanisole (BHA) and Butylated Hydroxytoluene (BHT): Just because it is called an antioxidant does not mean it is good for your health. These preservatives are made from petroleum and have been shown to be carcinogenic. Even though there are safer, more natural alternatives (like Vitamin E), many companies still use it because it is still allowed. They are used in everything from gum to cereal. BHA is especially important to avoid because it has shown to cause cancer in three different species of animals. Heptyl Paraben: This preservative is used in some soft drinks and beer. Although it is generally recognized as safe, its effects when combined with alcohol are unknown. Poorly studied preservatives make “guinea pigs” out of consumers, who consume these preservatives at their own risk. Propyl gallate: Although it is considered an antioxidant, don’t be fooled. This preservative is used (often together with BHA and BHT) to prevent rancidity. It has not been sufficiently studied for safety. Animal studies show that it can cause many cancers of numerous different organs. Sodium Benzoate: This preservative is used as an anti-microbial. Some who are sensitive to it have experienced allergic reactions. It has also been linked to hyperactivity in children. Benzene, a chemical that causes cancers such as leukemia, can be formed from sodium benzoate when it reacts with vitamin C. Only a few soft drink companies have been forced to change the chemical composition of their drinks to prevent this dangerous reaction from occurring. Sodium nitrite: Added for curing meats (ham, bacon, hot dogs, lunch meats), this preservative may cause cancer from nitrosamines that it forms once in the body, especially gastric cancer. It preserves the red color of meat. Think about it: why should your meat need help just to “look” fresh. Would you prefer old meat made to look fresh with chemicals or fresh meat? A meat company may claim that the nitrites they use are important for preventing bacterial growth. Although this is true, there are safer and healthier techniques, including proper refrigeration. What is more important to you? Preserving the “lifespan” of processed foods or preserving your own personal lifespan, and a healthy one at that? After considering the benefits and risks of preservatives, the choice is yours whether you will consume them or not.